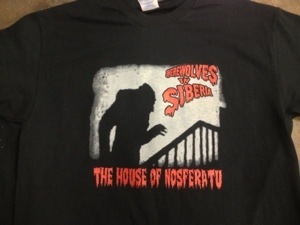 Available once again for just two weeks, The House of Nosferatu t-shirt comes with a digital download of the song of the same name. Previously, this track was only available with the Graveyard Calling Records compilation “…and Out Come the Bats”. You are still urged to pick up the comp as all proceeds go to Bat World Sanctuary. This shirt is only for sale until 7/14/14. All orders will be printed and shipped out on 7/15/14.